Anno Domino - Images & frequently asked question about domino toppling with gigantic wooden dominos. Championship Domino Toppling Book and Gift Set - Domino toppling champion Robert Speca (the �Domino Wizard�) teaches you his magic for setting up elaborate designs and then toppling the whole array. And, because 112 dominoes (four complete sets) are packed right with the book, you�ll be able to start trying his tricks instantly. DominoToppling.com - Domino toppling photos & videos from Scott Suko. Domino Dash - In Domino Dash, you will travel the world beating a series of domino toppling challenges in order to win fabulous riches! Windows shareware software. Domino Toppling Hobby - An article from Mike Perrucci about the hobby of domino toppling, with tips, tricks, and great pictures. Domino Toppling World Records - A listing of the world records for domino toppling, since 1974. 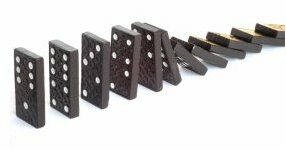 How To Make a Domino Effect - A free plan for how to make a domino effect. Includes a list of materials, a video, and complete step-by-step instructions. Tim Fort's Kinetic Art - Much more than mere domino tumbling, Tim's kinetic gadgets use a wide variety of chain-reaction techniques of his own invention. Weijers Domino Productions - A communication and production company specializing in domino toppling events for television and business. Dominoes, Dominoes, and More Dominoes - Video from a Japanese television show with dominoes of all kinds from luggage to mannequins high heels to coins. Domino Toppling Commercial - A commercial showing what happens if your light bulb burns out at a most inopportune time. Japanese Dominos - A video showing Japanese students setting up and toppling an amazing assortment of objects (VCR tapes, DVDs, CDs, bars of soap, and even dominoes) throughout their dormitory. Single-Handed Domino Toppling - The greatest number of dominoes set up single-handed and toppled is 303,621 out of 303,628 by Ma Li Hua (China) at Singapore Expo Hall, Singapore on August 18, 2003. The event was organised by LG Electronics Inc. Most Dominoes Toppled By A Group - The record for the most dominoes toppled is 4,002,136. The record was set at Domino Day 2005 in Leeuwarden, Netherlands on November 18, 2005. The previous record was 3,847,295 as part of Domino Day 2002. Solo Record For Most Dominoes Toppled In A Chain Reaction - 303,621 dominoes toppled by Ma Li Hua of China, on 16 Aug 2003, in Singapore. Team Record For Most Dominoes Toppled In A Chain Reaction - 3,992,397 dominoes toppled by Weijers Domino Productions at the Domino Day "Challenge", on 12 Nov 2004 in Leeuwarden, Netherlands. Brick Domino Toppling - On 17 January 2004, at the opening of the Weser tunnel in Germany, a brick toppling record was set when approximately 1,500 volunteers built a line of bricks (weighing 2 kg each) from Bremerhaven to Nordenham, a distance of almost 27 km [16.78 miles]. 250,000 bricks were set and toppled successfully. Domino Toppling Spanning Six Continents - On May 9, 1986 the Hemophilia Association domino toppling team toppled 300,000 dominoes in a satellite linked event spanning six continents. Starting in Atlanta, the chain reaction continued through Rio de Janeiro, London, Nairobi, Tokyo, Sydney, finishing back in Atlanta. The first domino at each site was triggered by an electronic signal relayed from a switch activated by the last domino at the prior site. Notes: All records are copyright Guinness World Records and The International World Record Breakers' Club, as of June 2005.